Over half way through the first month of 2017 already, the days grafting and sweating in the gym are speeding on by but we’re not complaining, this year is off to a cracking start for the gym with plenty of new faces as well as several familiar ones too who’ve returned to train with our team. We’re always delighted to see past students returning to the gym year after year. Providing the highest quality training and memorable experiences for our students at the gym is what matters most to our team and also what keeps them coming back for more. It’s satisfying for our trainers to see the same faces back at the gym and know that their skills and efforts are appreciated and respected. This week in particular the gym has been operating at full capacity, we’re one trainer down too so the schedule has been a bit busier than usual for the team but they’ve been relentlessly smashing their way through the extra pad rounds and physical demands placed on them. While there may be more bodies in the gym right now, the standard of the training always remains consistently high under the watchful eye of head trainer Bee who runs a very tight ship which is no easy feat. Our trainers are 100% dedicated to giving every single student a decent amount of 1:1 time, pad rounds and a thorough workout at every single session, pushing them to improve their technique and surpass their physical limits. 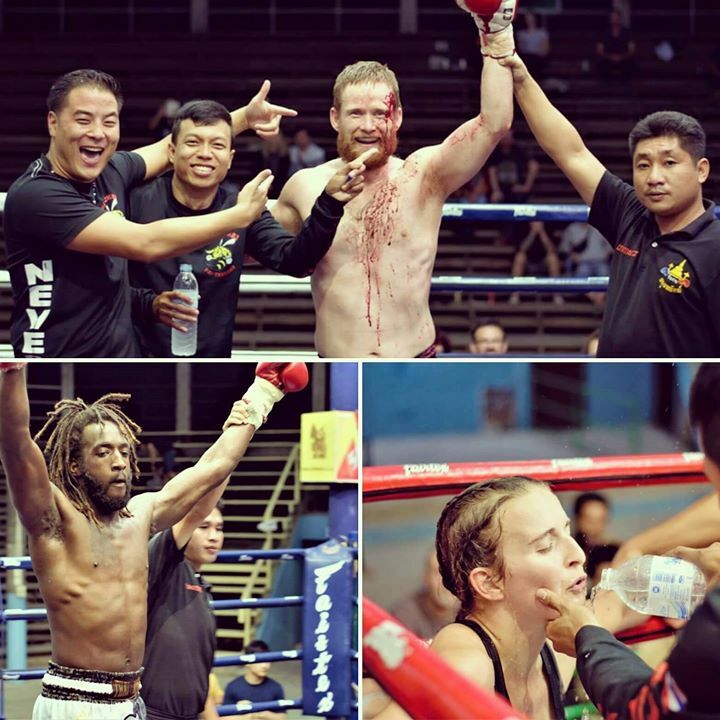 So far this month the team has prepared our students Adrian (Jamaica), Lenore (Holland), Ryan (New Zealand) and Roos (Holland) for matches at various stadia in Chiang Mai as well as our Thai fighter Mahamongkol for his second match at Channel 7 stadium in Bangkok last Sunday (which he won by judges decision). We also celebrated Bee’s 42nd birthday last weekend with one of his favorite past times KAREOKE and a barbecue at the gym which involved a whole cow and the fire pit (although it wasn’t quite as barbaric as it sounds). On the actual day of his birthday (Friday 13th January) Bee arranged for the monks from ‘Wat Pla Muang Pai’ temple to perform a blessing at the gym. Bee likes to hold a merit making ceremony at the start of each year to give thanks for the good fortune we’ve experienced at the gym and make a wish for a positive year ahead. 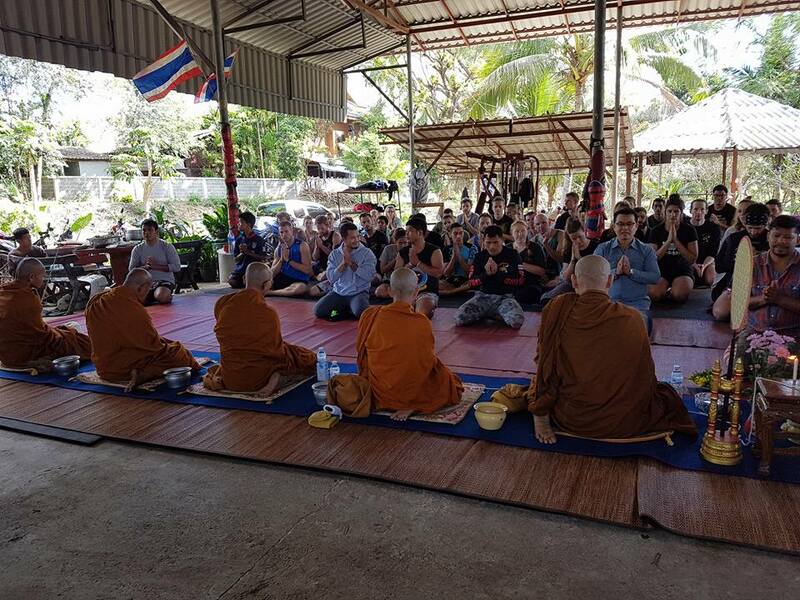 As always, our students were invited to be a part of the traditional Buddhist ritual which took place immediately after the morning training session and we are grateful so many of them wanted share this experience with us. 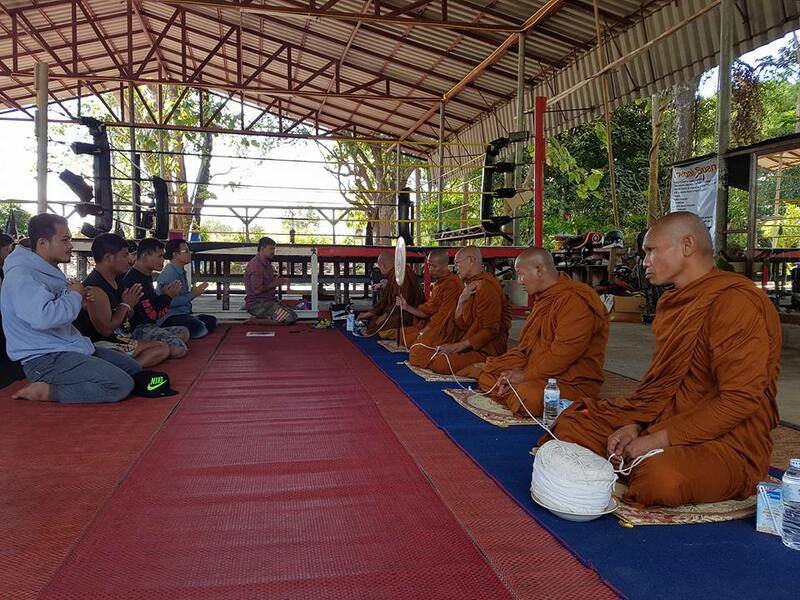 For us the gym is not only a place to train together but also somewhere for our students to get a glimpse of other parts of Thai culture and traditions outside of muay thai. 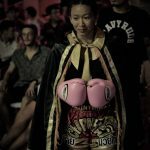 For anyone who has started off this year with plans to shed their winter weight and get fit, muay thai is an excellent way to achieve your goals. 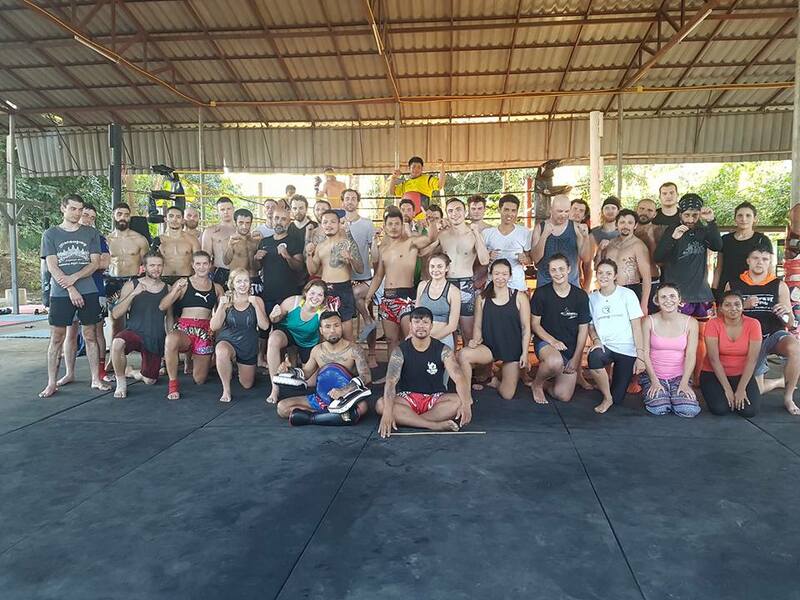 We are often contacted by men and women across the globe who want to lose weight and get back in shape but are unsure if they’ll be welcome or fit in at a muay thai gym as more often than not they’ve never done muay thai. The answer to their queries and uncertainty is always a resounding “YES YOU ARE WELCOME!” and furthermore we really love to play a part in helping our students achieve their fitness and weight loss goals and witnessing their physical transformations. There’s no ‘softly softly’ approach at the gym though, everyone is expected to give all they’ve got at every session and so long as the trainers see you are putting in the effort you’ll avoid the whip of the bamboo stick that Bee’s so fond of using to encourage and motivate students! 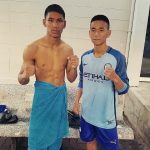 In other news, we recently welcomed two new Thai fighters to the gym, Game from Sisaket and Chai from Wat Chan (Pageryaw village just outside of Pai) who actually trained with Bee years ago when he was just a little lad, so as soon as they’re fight ready the team will be arranging matches for them in Chiang Mai initially to test their mettle. We’re excited to see what they can produce in the ring.